This book compiles technical, chemical and nutritional information in regards to the main species of the Theobroma genus, T. cacao and T. grandiflorum. The use of Theobroma cacao processing residues (pod and bean husks) as organic fertilizers, ingredients for animal feeding, sources of enzymes, fiber, hydrocolloids, and antioxidants, industrial biosorbents, and polymers for foams to formulate culture media, such as alkalis for soap production and as phenylalanine-free ingredients are discussed. T. cacao and T. grandiflorum phytochemical composition changes during processing and its importance on consumer health is stressed in order to contribute to clarify phytochemical function, their chemical structure, and how post-harvest processing could change them. The innovative use of chocolate as a carrier of encapsulated probiotics is also discussed. The development and application of the micro-encapsulation to increase the resistance of probiotic strains in chocolate-based matrices, uses of the main probiotic strains in the production of chocolates and derivatives, research involving the incorporation of probiotics in chocolates, and related products and symbiotic chocolates and future prospects in this area are all emphasized. The correlation between the consumption of cocoa and chocolate and human health is stressed, and experimental studies that have pointed out the beneficial effects of cocoa and dark chocolate consumption are compiled and discussed. 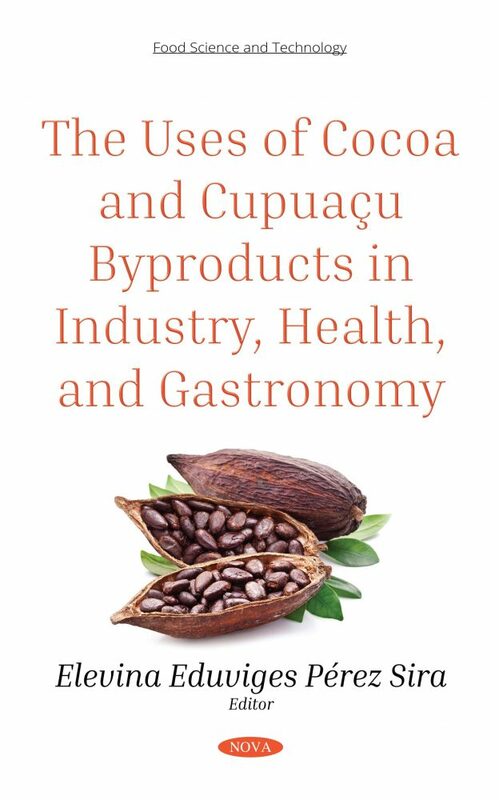 This book reports research that clearly demonstrates that cocoa components have an important antioxidant, anti-inflammatory and photo-protective role in pathologies (cognitive impairment, inflammatory bowel disease, dental health, skin photo-protection, and cancer) in which inflammation is one of the main features. Byproducts from the Theobroma genus are without a doubt one of the main ingredients in the gastronomic and food styling area. This book compiles recipes of both salty and sweet cuisine, as well as beverages prepared with ingredients from T. cacao and T. grandiflorum. The recipes are detailed with their correspondent nutritional information. This research shows that the versatility of products from Theobroma cacao and Theobroma grandiflorum are traditional, yet contemporary in a variety of beautiful and fancy dishes in gourmet cuisine.